Auriel Marquis, master craftman, really turned the building interior from a work site to a beautiful, inviting space. Putting up drywall is as much an art as a craft and Auriel is the best. From selecting the best quality sheetrock, to taping the seems, Auriel and his brother did a magnificent job. Rob Henselder from Power Line Electric did a cracker job in helping us design and install the Vineyard electric! Rob worked with us every step of the way in setting up the outlets and installing the wiring for recessed lights, track lights and emergency lights. With dimmers installed on most lights, the tasting room will lighting will be subtle and effective. Everyone, including the building inspector, is impressed with the great job done on the electric. When it came time to select a contractor for plumbing, heating and cooling, there really was no choice but Beacon Mechanical. We have worked with Beacon before, so it was no surprise to us that Beacon had the best prices for the work and did a great job. All of the Beacon team were professional and knowledgeable; a pleasure to work with. And, Beacon had lots of great ideas to improve on our plans for plumbing and heating which will save us money down the line. 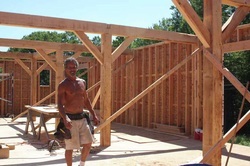 Pete Baril, from Pedabar Building did all the framing, siding and roofing of the barn. 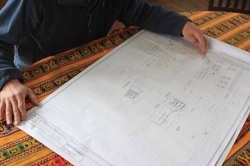 Not only is Pete a master craftman, he also has an aesthetic eye, coming up with many design features like the framing of the trapezoid window and adding a cathedral ceiling to the upstairs. The post and beam interior of the barn built with local lumber found by Pete adds to the rustic charm of the vineyard. Using recycled materials was good for the environment and kept our cost down. Any building is only as good as the foundation and Paul LaChappelle, a Granby native the job done right. Doing both sitework and foundation allowed Paul to think through all the aspects of the job and get it done quickly and professionally. It was very important to us that the cement floor in the basement was done right because that is where the wine would be made and it needed to be graded so we could keep it clean. Paul did a great job understanding and meeting these needs. Midway through the project, we needed some design work done and Lorri and her team stepped up and helped through some rough waters. Without Lorri and Rachel, we may have made some choices that would have ended up more costly in the end. In addition to helping us avoid pitfalls, Lorri and Rachel also helped make sure that the building was up to snuff from a building code perspective. Jeff Spence, Granby native, drilled our well. First step was to use dowsers to locate a spot where we were likely to find water. 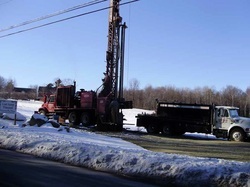 Once that was done, Jeff turned high tech bringing in state of the art well drilling equipment and brought us water! Jeff was a wealth of information on the well as well as other aspects of the building. 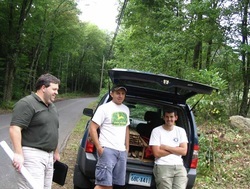 Brian Denno and his sons provided top notch surveying work both during the land clearing and situation the barn and septic. Patient with what probably seemed like never ending changes, Brian and his team rolled with the punches and made sure that we ended up with the building exactly where we needed it. 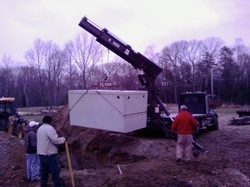 During the septic design, it was a never ending list of changes but in the end, Brian helped us design a cost effective solution that would meet our needs as we grew. Calnen Associates is a REAL family business - husband, wife team were joined by their teenage boys to paint the barn this summer. Most people end up waiting for contractors to fit them in; Tom and Ginny literally painted the barn as the siding was being put up. They were a pleasure to work with and looked for ways we could save time and money with the painting. 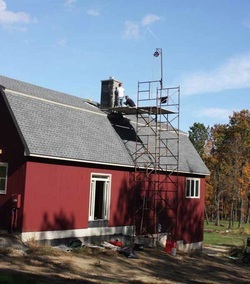 A beautiful chimney was essential to the look of the barn and we found just the team to get the job done right. Another family business, Jim Dubois and sons were great to work with and made our chimney a work of art. They helped pick out the materials to make sure we had the best looking chimney we could afford and came up with a number of ideas to improve the project. Charlie Kraiza, another Granby resident, was up to the task. 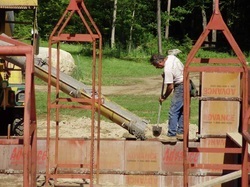 The septic installation was another project that survived many twists and turns to make sure it would meet the changing needs as the vineyard grew. Charlie helped us through all the changes in the design phase, and worked hard to get us the most cost effective solutions, and to make sure we were done before the winter freeze.